Burnley’s remarkable start to the season continued as they moved level on points with Premier League champions Chelsea thanks to a 1-0 victory at Southampton on Saturday. 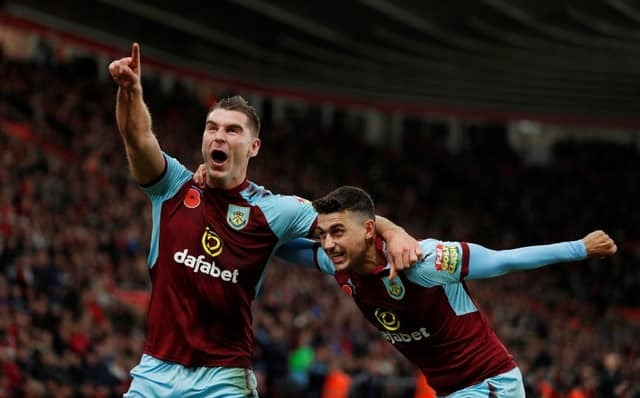 Sam Vokes pounced late on for Sean Dyche’s side to move them into sixth spot with 19 points — the same as Chelsea, who host Manchester United on Sunday, and Arsenal. Burnley have already won three league matches on the road this season compared to one in the whole of last season. Liverpool can move back above Burnley into sixth place with victory at West Ham United in the late kickoff. Bournemouth grabbed a last-gasp winner at Newcastle United to move out of the bottom three, above Swansea City who slumped to a home defeat by Brighton and Hove Albion. Huddersfield Town beat struggling West Bromwich Albion 1-0 at home to stay safely in mid-table — Dutchman Rajiv van La Parra deciding it with a curling shot just before halftime. Saturday’s early kickoff produced as many goals as the 1500 GMT kickoffs combined with substitute Peter Crouch ensuring a 2-2 draw for Stoke City at home to Leicester City.